When Indians batter Rajai Davis hit a foul fly ball to Cleveland's right field bullpen, Cubs outfielder Jason Heyward slid onto the warning track and around two uniformed Indians in an attempt to field the ball, which ultimately dropped untouched for a foul ball. Heyward's bullpen pursuit of the foul fly ball. An seemingly innocuous play on the first batter of the game, replays indicate the two Indians players/coaches whom Heyward had to avoid actually walked towards Chicago's right fielder as he attempted to make a play on the ball, and that Heyward's legs actually made contact with Cleveland's bullpen catcher, Armando Camacaro. With RF Umpire Marvin Hudson giving the "safe" mechanic, allowing Davis to continue his at-bat, we can surmise that offensive interference was not called. But should it have been? Case Play Question: As depicted above (and in the video below), is this interference? 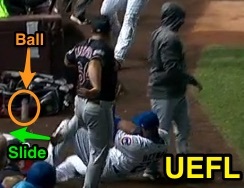 How would your ruling differ if instead of Cleveland bullpen personnel, Heyward had to contend with a Wrigley Field ballboy or security guard, all else equal? OBR 6.01(b): "Fielder Right of Way. The players, coaches or any member of a team at bat shall vacate any space (including both dugouts or bullpens) needed by a fielder who is attempting to field a batted or thrown ball. If a member of the team at bat (other than a runner) hinders a fielder’s attempt to catch or field a batted ball, the ball is dead, the batter is declared out and all runners return to the bases occupied at the time of the pitch." OBR Definition of Terms [INTERFERENCE](a): "Offensive interference is an act by the team at bat which interferes with, obstructs, impedes, hinders or confuses any fielder attempting to make a play."